Safeguarding and promoting the welfare of children is everyone’s responsibility and e-safety is no exception. As part of the DfE Keeping Children Safe in Education, Guidance for Schools and Colleges, e-safety is a significant part of the overall safeguarding picture. To help schools identify key e-safety requirements from the guidance, we have compiled an online checklist for schools. This can be used as a starting point or an aid to reviewing your current e-safety policy and practice. The 9 point checklist gives you an outline of the necessary action or procedure that needs to take place in your school, with references to additional information and support if you need them. 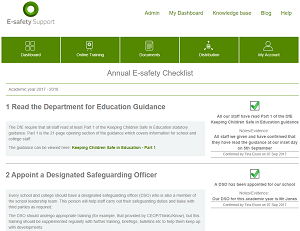 When you are happy that your school has completed the category, you can record this on the online checklist in your E-safety Support dashboard and add any supporting notes and evidence if required. Once you confirm that the action has been completed, this is locked and recorded for the current academic year. Each academic year beginning 1st September, we will save your progress, allowing you to review your activity annually.